The Nerf Cam ECS-12 Blaster is a high-capacity gun that records its own blaster action in an excellent in-built camera. This means that you can always relive your thrilling experiences of rapid-fire blasting with your friends when the action is over. Many Nerf gun enthusiasts have always raised concerns with the difficulty of handling and operating their gun. It seems as though this blaster was uniquely built to solve this particular problem because its design and size allow you to maneuver easily in the field of action. If you are used to a lesser toy gun, you are sure to enjoy greater action with the ECS-12 blaster because of its 12-dart rapid-fire blasting capacity. Many new users love the robust blasting experience that is made even easier with the trigger and ergonomic handle. Notably, this toy gun weighs a maximum of 4.3 pounds, which is about the normal weight of gun of its capacity. With the ability to fire up to a range of 85 feet away, the ECS-12 is truly one of the most efficient guns for total action. * Built-in camera for recording action. * Slam Fire handle for greater performance. * 4GB memory card for high capacity recording. * Robust construction for superior action. * Quick-reload 12-dart clip for swift performance. * Acceleration trigger for superior blasting. 1. HIGH Capacity built-in camera. This camera gives you a unique first-person camera perspective that is particularly captivating on the 1.77 color screen. You are able to capture the most memorable moments in photo or video and watch the experiences as often as you choose. The camera is designed with a user-friendly appeal that allows you to play back the videos or download its contents if you wish to share them with others. You are able to enjoy 100 minutes of high quality video or capture 2000 photos with remarkable ease. 2. SLAM Fire handle for super performance. 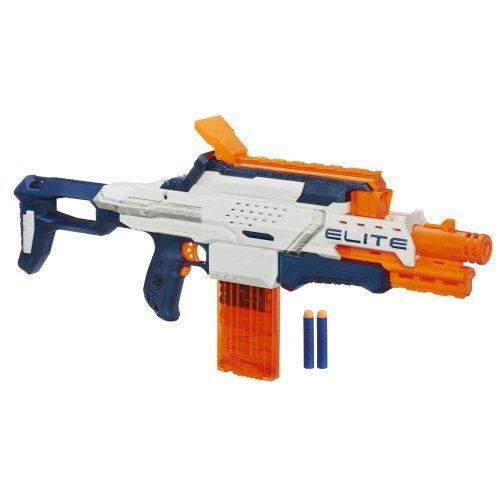 If you are holding this Nerf gun for the first, you will notice the feeling of great control that comes from the strong slam fire handle. In every sense, this handle was designed with a promise of super performance that helps to optimize the satisfaction of the lucky users. Youngsters with a penchant for blasting games usually appreciate handles that allow them great control and flexibility. Such qualities are especially necessary for field actions that are competitive in aspect. 3. 4GB Memory card for high capacity recording. One of the key strengths of this toy gun is the 4GB memory card. This card makes it easy for you to transfer the contents because the process simply entails detaching or removing it from the gun and transferring it to another device of your choice. Many users like the process of integrating the equipment so that they can share the videos and photos of their blasting supremacy with ease. Given this advantage, many users of this gun will find it quite suitable for recording actions faraway from home. 4. ROBUST Construction for superior action. The robust construction of this blaster contributes significantly to its great performance in a blasting game. The construction is strong enough to support the blasting action and sustain the velocity of the darts without easy jamming. Many users find this gun exceptionally appealing because of its compactness and user-friendly controls. The shapes and sizes of its various features are intended to give it a great ergonomic advantage that makes it outstandingly superior to many others within its price range. 5. QUICK-Reload 12-dart clip for swiftness. This toy gun comes with a high-functional quick-reload 12-dart clip that makes it swifter than many of its rivals on the market. Your chances of winning in a blasting game are largely dependent on your ability to reload your darts quickly and reengage your attention on the action. Apart from its advantage of reloading quickly, the ECS-12 blaster was made with the capacity of 12 darts, which gives it the potential of engaging in action for much longer than toy guns with a lesser capacity for darts. Pressing and holding on the acceleration trigger powers up your motor and readies it for a great motorized blasting action. You only have to follow up this action by pulling the launch trigger, which enables your Nerf blaster to start firing its darts with great velocity and at long distances. This special trigger gives you a feeling of satisfaction, particularly as you watch how the motorized systems works together with great harmony to produce a great blasting action with pinpoint precision. * Fires at long distances with great accuracy. * Durable construction for lasting efficiency. * Powerful blasting action with high velocity. * Rarely jams during the firing action. * Designed with remarkable ergonomic qualities. * This Nerf gun may be somewhat bulky for some underage enthusiasts. * The darts may lose precision in long range action. Q. What is included in the package? A. Blaster gun with built-in camera, memory card, clip, 12 darts and instructions. Q. What are the product instructions? A. 3.2 x 27 x 12 inches. Q. What is the maximum range for this toy gun? Q. How much does the product weigh? Size: 3.2" x 27" x 12"
Hint: click or tap the stars for the most helpful Nerf Cam ECS-12 Amazon reviews. Nerf Cam ECS-12 mod kit & step-by-step guide coming (very) soon. Click here to be the first to know when it's ready! Nerf Cam ECS-12 range test coming soon! Get the Cam ECS-12 Mod Guide!